In this post, I will try to show how using the Eye-Fi Pro X2 8GB SDHC card, fasten our camera and NAS in one, fully automatic machinery. After analyzing the situation and the available solutions, I decided to purchase an SD card with WiFi. When viewing cards available, guided by only one indicator of the power of WiFi antenna (and support for RAW files). Let’s take it to the logic, tiny card enclosed in the box, which can be reached? Something like bluetooth. In this statement the Eye-Fi has proved to be unbeatable and as far as I can tell after purchase, the card works in my entire apartment and sometimes I have the impression that he has a better antenna than the tablet. I made ​​it up myself so that the camera will record images as RAW + JPG, jpg will be “flew” on the NAS and indexed, will be immediately available on the TV through the media server. Everyone will be happy, the wife will have an immediate insight into the picture, and I’ll call when I have time (NEF will fly to another location). From the top I note that eye-fi applications on Windows and Android operating system run very well, their configuration is simple and is not the subject of this entry (Polish distributor distributes the manual of the cards after buying instructions (in Polish) type step by step ). Unfortunately, the circuit card with Synology has not proved easy, hence this blog entry. It is also the ultimate defense against server compromise eye.fi, stolen accounts do not give if you can only connect to the original address. And it’s all on the side of DSM, we automatically synchronized JPG images that are immediately indexed and available through the media server (DLNA). Configuring side eye.fi is simple (define appropriate ftp account) and does not require any particular translation, the only note is that if you want to make modifications in the ftp account, it is better to remove them entirely and define anew. On the Internet you can find various versions of “standalone eye-fi server” in this one, which can be installed directly on our NAS as a SPK . Apparently the work, but I decided not to install and configure them. Why? The use of such a solution closes our “mobile” solution in the framework of our apartment, it is safer, but the definition of the card can only specify one server to which you want to communicate it, and for that you can specify multiple WiFi network. If the server is not accessible from the outside, many WiFi networks will not do anything. You can have fun with manual changes to your account eye.fi, but why? It has to be fully automatic solution if you configure a WiFi network all within which we show up and we take pictures (for example, house parents, aunts, a favorite eatery or Hot-Spot) that we forget that we ever had to play in the stills camera ! And finally, the greatest magic, my camera is old, I bought it a few years ago on auction sites as “used”, the firmware version which gives it 1.0, ie as in a factory loaded. 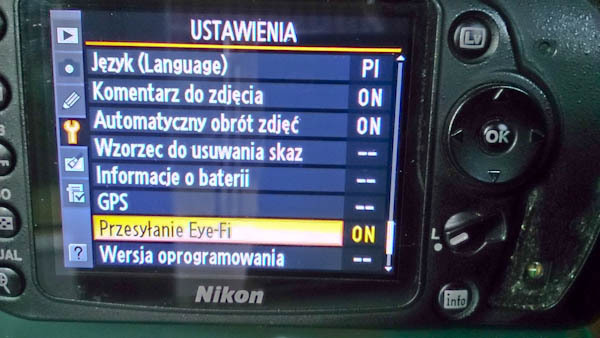 When you insert an SD card (Eye-Fi) in to camera, We have a new option in menu! As you can see, upload photos is not mandatory and can be disabled with the camera.